A large complex of springs in Yellowstone National Park, Mammoth Hot Springs, was created over thousands of years by hot water from the springs cooling and depositing calcium carbonate. Typically a bleached-white hue, the dramatic terraced sections flow with water originating from rain and snowmelt, causing a frozen cascade effect (though the water that forms this area is extremely hot). The flow of water depends on the environment at any given time, but you can walk the boardwalks along the lower and upper terraces, observing the scenery and wildlife. 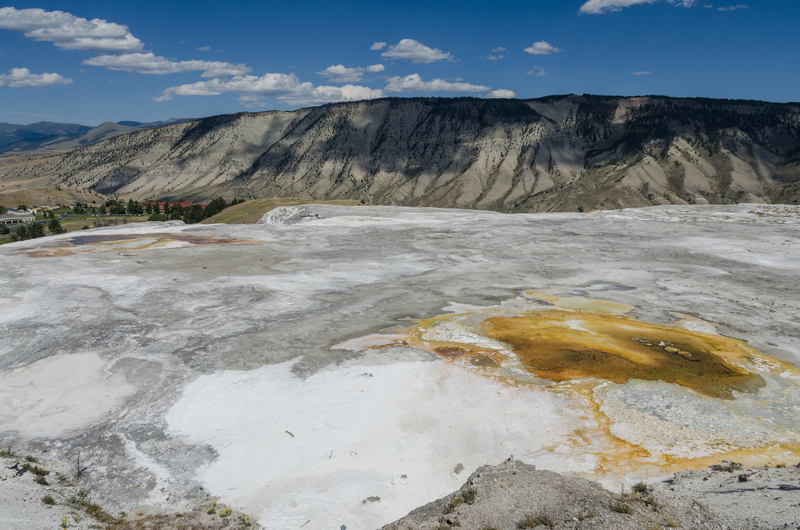 To visit Mammoth Hot Springs and other attractions in Yellowstone National Park, use our Yellowstone National Park trip itinerary planner. Yellowstone National Park in the world most compact springs. There are many geysers, are actively. This is where exactly can feel the pulse of the Earth.